We compare the latest Galaxy Nexus with the Apple iPhone 4S? 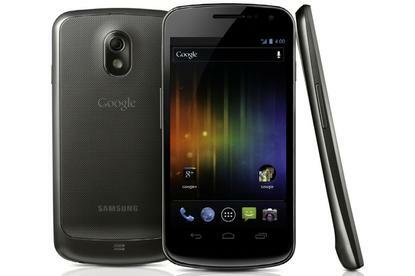 The Samsung Galaxy Nexus is the first smartphone to run the latest version of Google's Android platform, 4.0 or "Ice Cream Sandwich". It boasts a strikingly large 4.65in Super AMOLED HD screen and has a distinctive teardrop design. Naturally, its going to be compared to the popular Apple iPhone 4S. So, how does it stack up? • Where can you buy the Galaxy Nexus? The Galaxy Nexus has a bigger screen, a camera that claims to have zero shutter lag and runs Google's most advanced version of Android yet. Is it enough to compete with the iPhone 4S? Let's take a closer look. The Galaxy Nexus has a strikingly large 4.65in Super AMOLED HD display — one of the biggest screens currently available on the market. The HD points to a high definition resolution of 1280x720; we can tell you that the Galaxy Nexus displays an ultra sharp and crisp image. The screen is bright, vivid and clear and text is crisp and smooth with minimal visible aberrations. The large size of the screen makes the Galaxy Nexus great for video playback but the best benefit of the screen is the experience it creates when reading and Web browsing. Our only complaint is that the automatic brightness setting is often erratic. The iPhone 4S on the other hand has the same 3.5in sized display as the iPhone 4 it replaced. It looks TINY alongside the Galaxy Nexus but remains one of the best screens on any phone we've reviewed. The iPhone 4S display uses IPS technology and its 640x960 pixel resolution has been described as a "retina" display due to the human eye being unable to distinguish individual pixels. The iPhone 4S's screen has a pixel density of 330ppi — slightly higher than the 316ppi of the Galaxy Nexus. Verdict: The iPhone 4S' screen remains one of the best ever produced on a mobile device, but we have to award the win here to the Galaxy Nexus. Not only does it dwarf the iPhone in size, its also the best screen we've ever seen on any Android phone. Text is crisp and clear making reading and Web browsing a delightful experience, while the size of the screen doesn't make handling the phone an awkward experience. Samsung has equipped the Galaxy Nexus with a curved screen and a body that has a teardrop profile — this means the phone is thicker at the top and slightly wider towards the bottom. The curvature makes the Galaxy Nexus feel natural to hold and therefore comfortable to use. If you're worried that the Galaxy Nexus might be too big, don't — the phone has on-screen controls rather than capacitive keys that were previously standard on Android phones, so it isn't much bigger than the popular Samsung Galaxy S II. Unfortunately, the Galaxy Nexus' battery cover is way too fiddly and difficult to put back on once its removed. It's only a minor issue but the fit and finish is a step behind the iPhone 4S — the plastic feels durable but it doesn't look or feel as sturdy as a premium device should. We really like the non-slip grip that the back of the Galaxy Nexus provides, but we wish Samsung paid more attention to detail. The Apple iPhone 4S on the other hand retains an identical design to the iPhone 4. It's constructed largely from aluminium and glass, is just 9.3mm thick and has an industrial look and feel with distinctive, sharp edges. The iPhone 4S also retains the iPhone 4's glass back that does look slick but attracts plenty of fingerprints. The iPhone 4S is a superbly constructed smartphone, but it doesn't feel as comfortable to hold as the Galaxy Nexus due to its sharp edges. Verdict: We love the Galaxy Nexus' teardrop design, its subtle curve and the way it feels in our hands, but the winner here is the iPhone 4S. It may not be as comfortable to hold but there is no doubting it's superb build quality and construction. The iPhone 4S feels exactly like a premium smartphone should and even though the design is essentially more than a year old, it hasn't aged. The Galaxy Nexus is the first phone to run Google's latest Android software, Ice Cream Sandwich. The entire user interface has been refreshed to create a more uniform look and feel. It's faster and slicker than any previous Android software. It feels more consistent and easier to use. The camera shutter is staggeringly fast: there is almost zero shutter lag, so images are captured as soon as you press the on-screen shutter key. The Web browser is speedy and smooth and performance is consistently excellent. The iPhone 4S runs Apple's latest iOS 5 operating system. It offers the same familiar swipeable home screen enhanced by folders, and the consistent Apple UI look and feel extending across all of the standard applications. If you have never used an iPhone before, you can expect a device that is easy to pick up and use, a well-populated App Store, and excellent multimedia capabilities. The latest iOS 5 version of Apple's platform also introduces iCloud, a cloud storage solution that automatically stores your content and makes it available on multiple devices including a Mac or PC. All iPhone users get 5GB of cloud storage for free but can upgrade to larger capacities for an extra cost: 10GB for $21 per year, 20GB for $42 per year or 50GB for $105 per year. Verdict: Ice Cream Sandwich is a delicious upgrade to Android and ties up alot of loose ends. It's slicker, faster and easier to use than ever before. Despite this, Apple's iOS platform remains easier to use and its user interface is far more consistent. A choice between these two platforms ultimately comes down to personal preference: Android is far more flexible and offers more features, but the iPhone does the basics and does them incredibly well. Some might love iOS' elegance, others may hate its oversimplified approach. Some might love tinkering with Android, others may find it confusing. On that basis, we're calling this one a draw. The Samsung Galaxy Nexus has a 5-megapixel camera with single-LED flash that also doubles as a full HD 1080p video recorder. The best feature of the camera is its speed: it takes photos with virtually zero shutter lag and it really has to be seen to be believed. You can easily capture a whole heap of images in a matter of seconds, as the picture is taken the moment you press the on-screen shutter key. The Galaxy Nexus also has a 1.3-megapixel front facing camera will handle video calls and also record 720p HD video: a nifty addition for those who like to record themselves. The iPhone 4S has 8-megapixel camera that's widely regarded as one of the best mobile phone cameras on the market. It has a backlight illuminated CMOS sensor that claims to offer better performance in low light situations. The 4S camera can record 1080p video and has an image signal processor to provide image stabilisation and face recognition. Apple says the iPhone 4S takes 1.1 seconds to be ready for a photo and then just half a second between successive photos: not as quick as the Galaxy Nexus, but still very fast. Verdict: The Galaxy Nexus has a good camera, but the iPhone 4S has a great camera. We loved the fact that there is virtually zero shutter lag on the Galaxy Nexus but the iPhone 4S generally produces better quality images with a little more detail, less image noise and better exposure. The Galaxy Nexus is by no means a bad camera: in many instances it produces more natural looking photos than the iPhone 4S and its macro performance is very similar. But the win here goes to Apple. The main appeal of the Samsung Galaxy Nexus may be its Ice Cream Sandwich software, but the phone is packing some serious hardware, too. The Galaxy Nexus is powered by a 1.2GHz dual-core processor, has 1GB of RAM and either 16GB or 32GB of internal memory. There is no microSD card slot for extra storage, so you'll have to make the most of the on-board memory. A 1750mAh battery powers the device. The iPhone 4S is powered by an 800MHz Apple A5 dual core processor, but only has 512MB of RAM. It also has a dual-core graphics processor to speed up gaming. According to Apple, the dual core CPU combined with the dual-core GPU makes graphics performance up to seven times faster than the iPhone 4. A real positive is the 64GB model iPhone 4S, along with the standard 16GB and 32GB models. The iPhone 4S has a 1420mAh battery. Verdict: The Galaxy Nexus has a bigger battery, a faster processor and more RAM, but the iPhone 4S has more internal memory. In the end, how the internals work depends on the software: the iPhone 4S may have a slower processor on paper, but is anything but a slow phone. In the end, we'll call this one a draw. The Galaxy Nexus supports a wide range of video and music files and best of all it doesn't require software like iTunes to get music and video files onto it. You can simply plug the Galaxy Nexus into a PC via a USB port and drag and drop files onto the device. On a Windows PC the Galaxy Nexus appears in the control panel as a "portable device", but on a Mac or Linux computer you will need to download the Android File Transfer application in order to move files to and from the phone. The Apple iPhone 4S requires iTunes software to synchronise video and music files. It doesn't come with a HDMI-out port, but an optional Apple Digital AV Adapter ($45) can mirror whatever is on your iPhone 4S screen to a high definition TV. The Galaxy Nexus can be connected to a television via HDMI but only if you purchase a seperate MHL (Mobile High-Definition Link) adapter that uses the micro-USB port to output 1080p HD video and audio via HDMI. The Galaxy Nexus comes pre-loaded with the Google Maps Navigation application that offers free turn-by-turn GPS navigation. This is a real advantage over third-party turn-by-turn GPS applications for the iPhone 4S that often cost well over $50. The iPhone 4S comes with an exclusive software feature called Siri voice control. It's a voice assistant that lets you talk to perform tasks, such as asking for the weather forecast, making a calendar appointment, setting your alarm and creating a reminder. It’s a Beta release, but Siri works with Australian English in addition to US and UK English languages. Another point worth noting is the fact that the iPhone 4S is a world phone, meaning it will work across both 3G and CDMA networks. There are no longer any CDMA networks in Australia, but for those who frequently travel to the US, the iPhone 4S' status as a "world phone" will definitely come in handy. The Galaxy Nexus is a quad-band HSDPA phone, so it will work across all Australian 3G networks including Telstra's 850MHz Next G network, and the 900 and 2100MHz networks used by Optus and Vodafone in Australia. Samsung says an LTE version of the Galaxy Nexus will be available "depending on the region" but has not clarified whether Australia will be part of that. Telstra's new 4G network operates on the LTE 1800MHz spectrum band. What do you think about the Galaxy Nexus and the Apple iPhone 4S? Let me know in the comments below!